Want to spend the night in a James River Bed and Breakfast Inn? What could be more romantic than having a special evening in an authentic, historic plantation home that lets get a taste of what life was like in those long-ago antebellum days? Edgewood Plantation does weddings, Victoria teas...and elopements! After visiting one or more of the local historic plantations, including Shirley Plantation and Berkeley Plantation, you may be looking for a historic place to stay. Luckily, three of the James River plantations operate as inns, so you can feel a part of history while having a special romantic weekend getaway. Located conveniently halfway between Berkeley and Shirley, this Victorian gingerbread plantation home is full of character, right down to the wicker chairs on the veranda for lounging an afternoon away. In the past 150-odd years, this quaint plantation has had many incarnations, including a restaurant, a church, a nursing home, a post office, and a signal post that allowed the Confederates to spy those darn Yankees. Edgewood Plantation also offers weddings and "elopement packages," Victorian-themed teas, and birthday parties. For evening more relaxation, they offer a massage therapist on call. Prices range from $149-$199 per night. 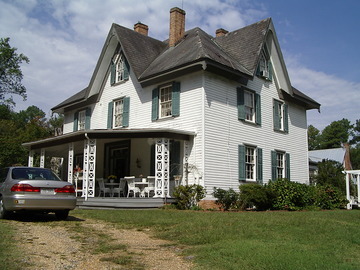 More than a single house, this James River Bed and Breakfast inn includes several white clapboard buildings to give you the full plantaiton effect. They offer modern conveniences--private baths, hair dryers, and refrigerators--combined with lovely period antiques. This romantic weekend getaway includes an elaborate breakfast served by candlelight. Special refreshments at Piney Grove plantation to pamper you include mint juleps and hot toddies depending on the season. During the day, you can enjoy their outdoor pool, play lawn games, stroll along their scenic nature trail, or just spend time viewing their farm animals. Room prices range from $139-$180 per night. In the evening, you can pop on over to Indian Fields Tavern for one of their lovely candlelight dinners. This inn hosts a variety of seasonal and holiday "Progressive Candlelight Plantation Tours & Dinners which allow you to tour the plantation, and enjoy an four-course candlelight dinner. The meals start at around $75 per person). Northbend Plantation is bills itself as a "Greek-revival" house, complete with several fireplaces, romantic canopy beds, and a billiards (pool) room. Their amenities include an outdoor pool, playing horseshoes, or riding bicycles around the estate (all 850 acres of it!). Like Edgewood Plantation, they offer wedding packages and allow you to rent out the house for special events.